R Davies & Son Funeral Directors in Whitchurch provides quality funeral care to the local Bristol community. We are here for you at this difficult time and can arrange a meaningful funeral for your loved one. Your wellbeing matters to us and we will provide the right support when you need it. This means offering comfort, taking the time to discuss your requirements and finding out how we can make the send off a truly personal occasion. We will also ease any concerns you may have and offer guidance, tailoring the funeral to meet your wishes. The experienced team at our funeral directors will treat you with kindness while you are in our care and ensure your loved one is tended to with dignity and respect. In 2018, we changed the name of our funeral home from Whitchurch Funeral Service to R Davies & Son, continuing to provide the same high standard of service as we have done since 2010. We can be found on Gilda Parade, which runs adjacent to Wells Road (A37). 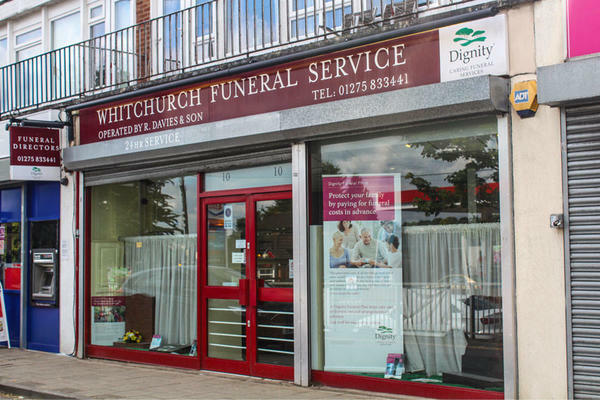 From here, we are able to offer our funeral care to the whole of Whitchurch, as well as the surrounding areas of Bristol. This includes Brislington, Stockwood and Knowle. We are always here to talk, 24 hours a day. For a dignified funeral for your loved one, call us today. Call us today on 01275 833441 to talk through your personal requirements. Our funeral home is on Gilda Parade, which runs adjacent to Wells Road (A37), opposite the Esso petrol station. Our staff are available 24 hours a day on 01275 833441 if you require our services outside of these hours. My brother and I was very happy with the service we received from your staff. For both my mum Brenda Howell’s funeral in February 2019 and then again for my dad Sidney Howell in April 2019. Lisa was really kind and helpful to us nothings was too much trouble at our very hard times. Also Michael done my mum and dad proud and treated us so kindly. Peter gave a really lovely service for both my mum and dad. Everyone treated my parents with respect. We can not thank you enough. Thank you for the kind comments posted on your online review. I am pleased that we provided the highest level of care and guidance for you and your family and that the arrangements for both your Mother and Father were carried out to your satisfaction.